Plague caused by Yersinia pestis is a zoonotic infection, i.e., it is maintained in wildlife by animal reservoirs and on occasion spills over into human populations, causing outbreaks of different entities. Large epidemics of plague, which have had significant demographic, social, and economic consequences, have been recorded in Western European historical documents since the sixth century. Plague has remained in Europe for over 1400 years, intermittently disappearing, yet it is not clear if there were reservoirs for Y. pestis in Western Europe or if the pathogen was rather reimported on different occasions from Asian reservoirs by human agency. The latter hypothesis thus far seems to be the most plausible one, as it is sustained by both ecological and climatological evidence, helping to interpret the phylogeny of this bacterium. Bos KI, Herbig A, Sahl J, Waglechner N, Fourment M, Forrest SA, Klunk J, Schuenemann VJ, Poinar D, Kuch M, Golding GB, Dutour O, Keim P, Wagner DM, Holmes EC, Krause J, Poinar HN. 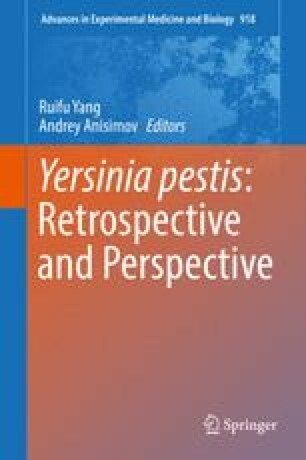 Eighteenth century Yersinia pestis genomes reveal the long-term persistence of an historical plague focus. eLife. 2016. doi: 10.7554/eLife.12994.